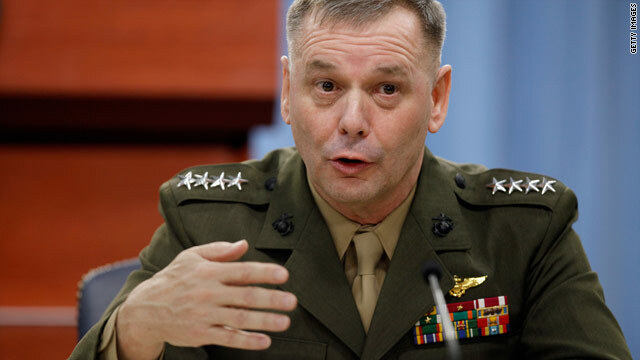 Top Egyptian military officials cut short meetings in U.S.
Marine Gen. James Cartwright said that the U.S. and Egyptian military need to "exercise restraint." NEW: A U.S. general says that the U.S. and Egyptian military need to "exercise restraint"
Washington (CNN) -- Several top Egyptian military officials cut short their visit to the Pentagon on Friday, returning to where their rank-and-file were rolling through the streets to stem massive protests, a top U.S. military official said. Marine Gen. James Cartwright, vice chairman of the Joint Chiefs of Staff, said that the talks involving Egyptian military officials have been aborted because of the developments. The discussions had been scheduled to run through next Wednesday, February 2. Cartwright said that -- as a matter of protocol -- the U.S. and its allies "go through all sorts of contingencies" in case of major international developments. He refrained from taking any position on the unrest, beyond calling for calm. "The key activity here that's really important is to exercise restraint, and to do so both on (the U.S.) part but also on our counterparts in the Egyptian military," he said. The Egyptian officials had been in northern Virginia, just outside Washington, to attend the annual U.S.-Egypt Military Cooperation Committee meetings. At these, officials typically discuss military training, security assistance and defense industrial cooperation. The chiefs of the U.S. Army, Navy, Air Force and Marines had been scheduled to meet with the Egyptian officials. The sessions were being hosted by Alexander Vershbow, the U.S. assistant secretary of defense for International Security Affairs. Who would fill Egypt's power void? Earlier, Pentagon spokesman Col. Dave Lapan addressed concerns over the image of Egyptian and American military officials meeting in the Pentagon at a time when some Egyptian authorities have used violent methods to put down protests in that country. Lapan told reporters, "We the Department of Defense have had a long-standing military-to-military relationship with Egypt. This is the 27th version of these talks, and as we have talked about in other contexts, military-to-military engagements are useful to share information and perspective. So in some ways it's valuable, in that sense, to be able to hear first-hand from senior Egyptian military leaders their perspective and such." The setting for the U.S.-Egypt Military Cooperation Committee meetings alternate each year, between the United States and Egypt. U.S. military cooperation has helped Egypt modernize its armed forces and strengthen regional security and stability. Under Foreign Military Financing programs, the United States has provided F-4 jet aircraft, F-16 jet fighters, M-60A3 and M1A1 tanks, armored personnel carriers, Apache helicopters, anti-aircraft missile batteries, aerial surveillance aircraft, and other equipment. The United States and Egypt also participate in combined military exercises, including deployments of U.S. troops to Egypt. Every other year, Egypt hosts Operation Bright Star, a multilateral military exercise with the United States, and the largest military exercise in the region. Units of the U.S. 6th Fleet are regular visitors to Egyptian ports. Recently, Wikileaks released a leaked U.S. diplomatic cable from Cairo, dated March 2009 which indicates Washington provides Cairo with more than $1 billion a year in foreign military assistance to buy American weapons and defense equipment. The cable read, "President Mubarak and military leaders view our military assistance program as the cornerstone of our military-military relationship, and (they) consider the $1.3 billion as 'untouchable compensation' for making and maintaining peace with Israel. The tangible benefits to our mil-to-mil relationship are clear: Egypt remains at peace with Israel, and the U.S. military enjoys priority access to the Suez Canal and Egyptian airspace." While travelling in Canada Thursday, U.S. Defense Secretary Robert Gates commented on the protests in the region. Gate said, "We obviously have a number of close friends and allies in the region, with whom we work very closely on a wide array of issues, not just in the region but globally. At the same time, the United States has been clear that the human and political rights of people are fundamental, and the economic challenges that face many of the people in the Middle East are important as well. And therefore, we encourage reform across the board that addresses these challenges, and look forward to continuing to work with these governments." Pentagon spokesman Lapan said there has been no indication from the U.S. Embassy in Cairo that an evacuation would be necessary. Lapan said, "We always have contingency plans in place, for situations like this. But there's usually a progression of steps, like going first to a 'voluntary evacuation.' We are not near a military engagement at this time."